#The number of product launches has been restated as a result of the refinement of the product launch definition. Our Developed Europe business is made up of operations in Europe's major developed countries. The Anaesthetics and Thrombosis portfolios are the leading therapeutic focused brands in Developed Europe. The API site at Oss, supported by its satellite operation at Sioux City, supplies APIs worldwide. The Notre Dame de Bondeville and Bad Oldesloe sites are strategically important manufacturers for the Group. Volumes of all products in the Developed Europe injectable anticoagulants category declined 1,5%. 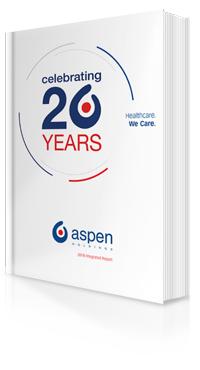 Aspen's share of the injectable anticoagulants category across Europe remained stable at 18% as at 30 May 2018.